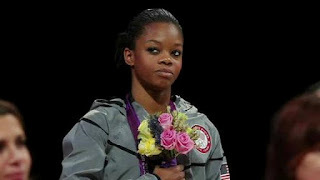 This week's side-eye is being given to the folks who are foolishly obsessed with Olympic gold medalist Gabby Douglas' hair. 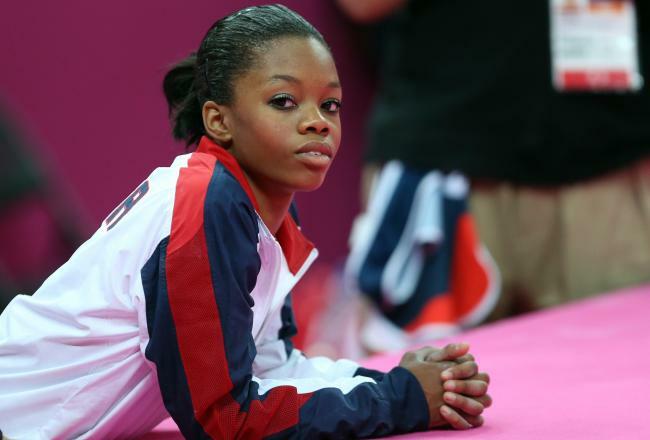 This beautiful sixteen-year-old young lady made HISTORY as the first African-American gymnast to win all around GOLD at the Olympics. Her mom and sister watched from the stands as she catapulted into the history books and into the hearts of people all over the world. Her hard work paid off. Her determination and faith in God brought her to one triumphant victory after another. She has grace, style, and a megawatt smile. She is intelligent, humble, and a true team player. She has graced the covers of Time and Sports Illustrated. She has received accolades from President Barack Obama. Yet, a few ignorant people attempted to overshadow her success and stir up controversy by commenting repeatedly on the child's hair. “I love how she’s doing her thing and winning. But I just hate the way her hair looks." "With all those pins and gel ... I wish someone could have helped her make it look better since she’s being seen all over the world." "I know every black female looked at Gabby Douglas' hair and asked Why? Just why?" Actually, no, we didn't. Only a few foolish ones bothered to pay attention to such a trivial detail. The rest of us were too busy rejoicing over her victory. 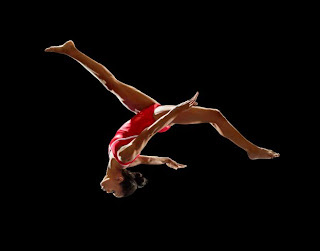 We cried tears of joy as she brought her opponents from Russia to their knees with her floor exercise, her pole vault, and her performance on the uneven bars. Only those who were searching for something, anything negative to say were preoccupied with the appearance of her hair. We were too busy noticing the pride in little brown girls' eyes as they saw someone who looks just like them making history. We were too busy cheering and jumping up and down to pay attention to her hair. And Gabrielle was too busy WINNING to pay them any mind. Sometimes people make me sick with their preoccupation with such stupidity. It seems that no matter how hard you work, no matter what victories you've won, there are always some folks on the sidelines complaining about how you should have done it, what you should have been wearing. Instead of stepping off of their soapboxes and doing something groundbreaking with their own lives, they find it easier to sit around and judge those of us who are actually DOING SOMETHING. Side-eye, indeed, Gabby. To those haters who took the time to criticize her hair, this week's distinction is yours. The rest of us choose not to dwell on such ridiculous topics. We're truly inspired by this young lady's perseverance, her profession of her faith in God, and her grace under pressure. Go, Gabby. You've made us incredibly proud! Bottom Line she has the World's Upmost Respect for her "Walk in the Olympics" to know that she started so young and even had to spend time away from her family for months on end to train. I KNOW ONE THING, THERE IS NO ONE MORE PROUD OF GABBY THAN HER "MOM". OOOH WHAT A FEELING! Angie, I honestly NEVER noticed her hair either. Not until all the controversy started swirling. I'm really surprised at how negative some of us can be. I'm so very proud of this young lady. I'm proud of her mom as well for being unselfish enough to let her daughter move to another state in order to train with the best possible coach. Watching her get that gold medal last night had me crying tears of JOY! Watching her Mom up there in the stands gave me chills. PROUD!! That's what I felt. I'm Team Gabby, too, Angie! 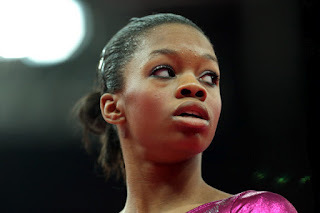 I am proud of Gabby Douglas. Who cares about her hair? There is NOTHING wrong with her nor her hair. She is out there in London at the Summer Olympics 2012 winning, breaking records and making herstory, history, and ourstory. She is out there working hard on what she trained for. Some of us Black folk are our own worst enemy sometimes. She is a positive role model for all people as she succeeded against many odds and over adversity. I didn't notice her hair either. I'm so proud of her too. I'm never moved to tears and boy did I feel joy in watching her success. I'm a grown woman and felt her success was my (our) success. Folks, especially Black women (not all) need to stop with their f*ckery and learn to compliment and build each other up instead of always looking for something to say. I bet half, no more than half, those focused on her hair 1) aren't in half the shape she is, 2) has a bag of something on their own head, and 3) can't touch her! Who gave them the authority to speak for "all Black women"? These have to be women that think their hair must be all that and can't get by on any thing else. When I first heard of this controversy I was speechless! I grew even more upset when the media caught wind of it and ran with it. Making it into an even bigger issue. Gabby made HISTORY, yet they want to talk about her hair. My people, my people, my people.....why do we allow this? I'm so glad that Gabby is comfortable in her skin and sees and recognizes her true beauty. Gabby Douglas is awesome, period! We should be focusing on her talent and nothing else. 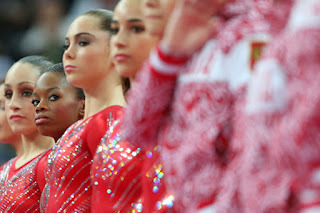 She's the only one to earn a gold medal in both the team final and all around, as well as the first African American. We need to be celebrating this historical event. I hate that her moment is being out-shined because of these stupid tweets! Please let her have her moment!